We do not know anything about this except that: the loco in the distance looks like an LNWR DX; the station nameboard, above the doorway to the right of the woman on the platform, reads “DERBY JUNCTION”; and the sign on the fence reads “E. W. COTTERILL”. A quick check in Pre-grouping Atlas did not reveal DERBY JUNCTION but have not tried any other sources. So where was Derby Junction? When was the photograph taken? This is Hampton, between Coventry and Birmingham on the L&B main line, looking north-west. The building on the right was the Midland Railway (ex-Birmingham & Derby Junction Railway) station. The MR line to Tamworth, Burton-on-Trent and Derby can be seen beyond the green-liveried outside-framed MR 0-6-0, curving off to the right. This building was still standing only a few years ago, and might still exist (?). 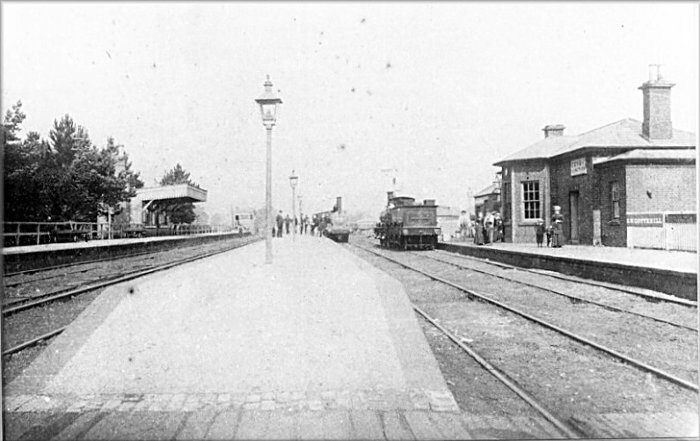 The date is after 1873 (lamp at the foot of the LNWR engine chimney) but before September 1884 when the station closed and was replaced by a new station about a quarter-mile behind the camera. The new station was renamed ‘Hampton-in-Arden’ in 1886. This one is on ‘foreign’ territory, approximately half a mile north of Derby Midland with the right hand line about to curve sharply right to pass Chaddesden sidings and head for Nottingham, generally referred to as the Chaddesden loop and opened 1839. The engines are I think Midland, that on the right appearing to be a Kirtley double frame 0-6-0. The only reference I have found is in Colonel Cobb’s atlas where he shows a closure date of 1840 although there was clearly activity at a later date as in this picture which I would guess to be around 1870. The line to Nottingham that exists today opened in 1867, which may be the more likely date for the closure of Derby Junction, and may be the date for this picture. This picture appears as Plate 20 in ‘Pre-Grouping in the West Midlands’ by the late P.B.Whitehouse (OPC 1984), together with an extended caption. I was well caught out by Derby Junction, and agree that Hampton is the correct location. A remarkable coincidence that there really had once been a station of that name! The station building, the Midland Station at Hampton, still exists but not in railway use, and is now in situated in a builders yard.